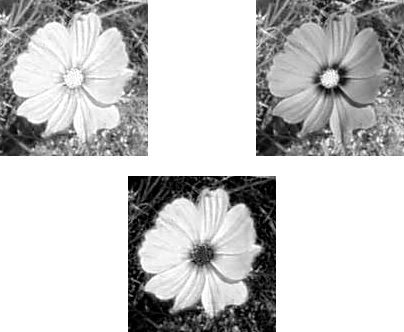 This command constructs an image from several grayscale images or layers, for instance from extracted RGB, HSV... components. You can also build an image from grayscale images or layers created independently. You can find this command in the image window menu under Colors → Components → Compose…. It is enabled if your image is grayscale. You can select there the color space to be used: RGB, HSV... The options are described in the following Decompose command. Mask Value: Instead of selecting a layer or an image to build the channel, you can give the channel a value from 0 to 255. But note that at least one channel must be formed from a layer or image. 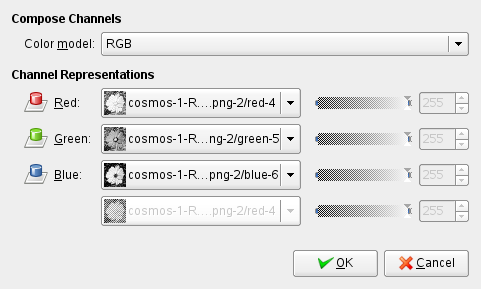 If Compose options are different from Decompose ones, for instance an image decomposed to RGB then re-composed to LAB, you will get interesting color effects. Test it!